How is it even possible to make quesadillas for 8 in just 8 minutes? Get out the Mexican VELVEETA and tortillas, and we'll show you how. 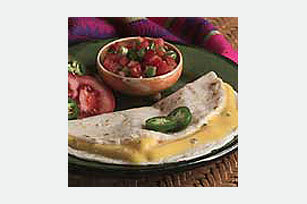 Place 1 VELVEETA slice on bottom half of each tortilla; fold in half. Place 2 tortillas on microwaveable plate. Microwave on HIGH 30 to 45 sec. or until VELVEETA is melted. Repeat with remaining tortillas. Garnish with chopped fresh tomatoes just before serving.